(CNN) -- Key West's historic Duval Street reopened Monday morning after a fire swept through a building housing three well-known businesses and temporarily shut down other popular spots on the island city's main street. 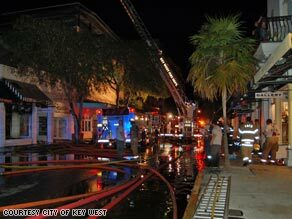 A fire broke out late Sunday night on Duval Street in Key West. The fire, which started at about 10:30 p.m. Sunday and was contained by 1 a.m. Monday, wiped out a crepe shop, an art gallery and a sign shop. Two firefighters suffered minor injuries, city spokeswoman Alyson Crean said. The fire department was working Monday to determine the cause of the blaze, Crean said. Singer Jimmy Buffet's Margaritaville restaurant and store was one of the businesses initially shut down, halting late-night festivities at the popular watering hole in mid-pour. "I was hoping to go back in, finish off my shift and clean up, but they wouldn't let us back in," said waitress Patricija Hambrook. "It became bigger than we thought. "We couldn't close out checks, and the drinks we made were never served." Margaritaville's restaurant reopened Monday afternoon, and its adjacent retail store reopened a few hours later, the fire department said. In addition to protecting Margaritaville, firefighters kept flames away from the historic San Carlos theater, although the facility's administrator said that a large broken out window and about 2 inches of water on the floor of the lobby would keep it closed for a few days. Alex Pascual said he anticipated the theater would reopen by Thursday, in time for a concert scheduled for that evening. The San Carlos was founded in 1871 and was the site of Cuban patriot Jose Marti's 1892 speech launching his drive for Cuban independence. Fire officials initially shut down Duval Street to vehicular traffic but allowed pedestrians to stroll the sidewalks. Traffic restrictions prompted some business owners to be concerned about their livelihoods, at least for the short term. Robert Porter, assistant manager of Crazy Shirts, was concerned early Monday "because there aren't any cars driving through." But Banana Republic general manager Darren Paugh said the foot traffic and onlookers curious to see the aftermath of the fire "should increase business for the day." Plus, he said, three cruise ships were in port Monday morning. And Crean indicated life for tourists won't stop in Key West because of the fire. "We have a lot of spring breakers on vacation and bikers coming from Bike Week in Daytona," Crean said. All the concern proved unfounded when officials reopened Duval Street at about 10 a.m. Monday morning. For the owners of the three businesses that took the brunt of the fire, however, it will be some time before it's business as usual. "It's a big loss for us. And we worked so hard, it's not fair," said La Creperie Cafe owner Yolande Findlay in a story published on the Keynoter newspaper's Web site Monday. Findlay, according to the paper's Web site, opened the popular crepe shop with her partner, Sylvie Lenouail, six years ago. Both are from Brittany, France. The American Royal Art gallery, which specialized in entertainment art, and the sign shop Montage were destroyed in the fire.